West Side Beta President, Elleana Sissom, gives a speech on Veteran's Day as the rest of the Beta Club listens. West Side School had their Veteran's Day Ceremony at 8:00 am Wednesday, November 11. The entire school circled around the flag pole out front to listen to the presentation by the West Side Beta Club. 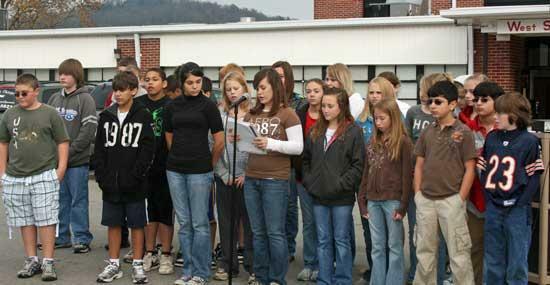 The Beta Club led the school in the Pledge of Allegiance, then held a moment of silence. Then the President of the Beta Club, 8th Grader Elleana Sissom, gave a short speech about Veteran's Day. She talked about why we celebrate Veteran's Day, about the soldiers who are fighting today for freedom, including a brother of one of the 8th grade students. She then introduced the 4th Grade teacher, Mrs. Jennifer Cherry, who is a veteran. Mrs. Cherry was in the Army Reserve between 1998-2006. She was a Staff Sergeant E-6 with the Military Police who was deployed to Iraq in 2003. "Yesterday is history, Tomorrow is a mystery, and Today is a gift, that is why it is called the present. Today is Veteran's Day, a gift for you and me to honor those who have given their lives for our daily freedoms. Today, please take the time to thank a veteran, or listen to their stories."